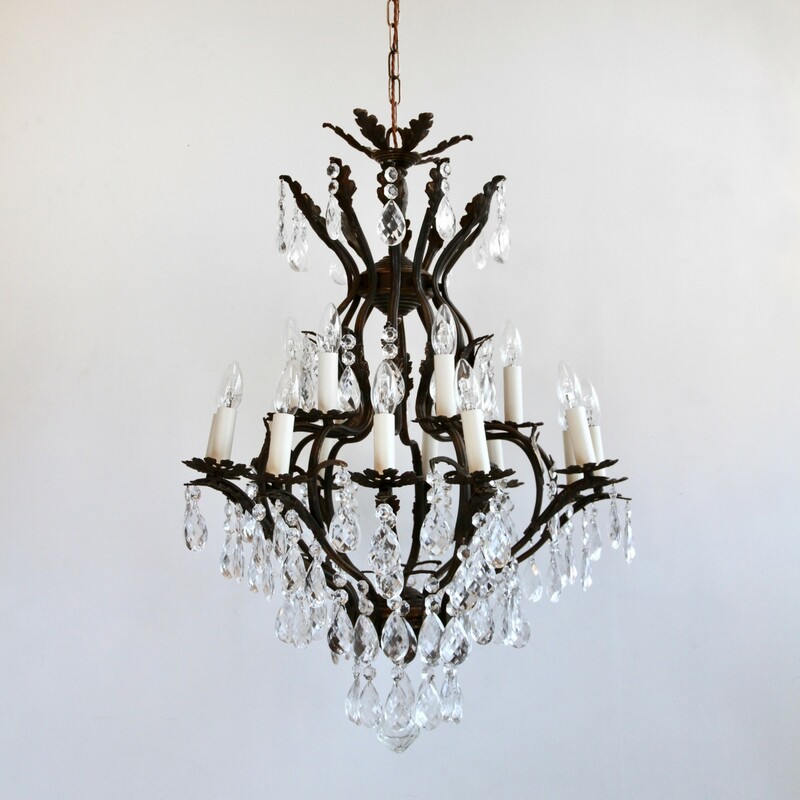 This heavy cast large birdcage chandelier originates from early 1900s Italy. Dressed in harlequin pears it is a stunning centre piece. The large chandelier frame is heavily oxidised and holds 18 lamps in total, on both upper and lower parts of the frame. The top and middle crowns are brass leaves, the lower holding two glass buttons and harlequin pears. There are also added cast brass leaf details on the central cage of which two glass buttons and harlequin pears are suspended from. The dark oxidised frame has not been polished back to retain its natural aged effect. The chandelier comes supplied with braided flex, chain, a ceiling rose and a chandelier hook plate. Chandelier requires SES lamps, these are not included. This chandelier has been fully restored and rewired here, in Stockport, near Manchester by our small team of experts and is now ready to be installed. We recommend that this heavy cast large birdcage chandelier is installed by an electrician and into a joist or a supporting noggin. To clean the chandelier dust the brass components regularly with a soft cloth. The crystal drops can then be wiped with a glass wipe or a cloth that has been sprayed with glass cleaner. A final wipe with a paper towel will give a polished finish.